We are beginning to see more and more pets that test positive for Lyme disease in our clinic. Most of these cases are not clinical, but more dogs are having positive results on routine screening tests. Few though have resulted in clinical disease warranting treatment. We at Rock-N-Country Veterinary Services want to make sure our dog owners are aware of this disease so they can spot the signs early for fast treatment initiation and to protect themselves. “Ixodes Scapularis and Ixodes Pacificus.” CAPC Vet, www.capcvet.org/guidelines/ixodes-scapularis-and-ixodes-pacificus/. Though not as common as some of the other tick-borne diseases currently in the Southestern United States, this disease can result in significant clinical disease possibly leading to kidney failure. Borrelia burgdorferi is the organism that actually causes Lyme disease. It is a small parasite that is transmitted by infected ticks, specifically the Ixodes scapularis tick. This tick has historically been isolated to the cooler region of the Northeastern United States but has slowly made its way down to Tennessee. The majority of dogs that are positive on our screening test do not have clinical disease. This simply means that the dog has been exposed to the tick at some point in its life and now has circulating antibodies. These dogs do not require treatment and just need to be monitored for signs of disease. Dogs that do have clinical disease often have "Lyme Arthritis". The common clinical signs are fever, lethargy, anorexia and swollen painful joints. The owners will often give us a clue by saying that their dogs ins't on tick prevention or they recently removed several ticks. “Lyme Disease.” Centers for Disease Control and Prevention, Centers for Disease Control and Prevention, 26 Oct. 2016, www.cdc.gov/lyme/signs_symptoms/index.html. 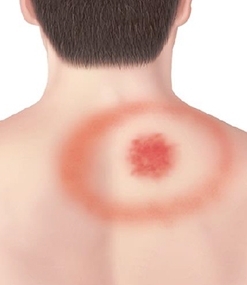 Lyme disease in people is the most common vector-borne disease of people in the United States. It can result in a local reaction that resembles a target or bull's eye pattern, fever, headache and arthritis. Some resource say that experimentally, dogs infected with lymes disease can transmit the disease to other ticks serving as a reservoir of the disease. The tick however, typically would not immediately bite a human after a full blood meal from a dog. Other sources say that direct transmission does not occur. If your pet is positive for Lyme disease, they do act as a sentinel for the disease. As a sentinel, your pet alerts you to the disease and lets you know that there are infected ticks in your immediate area. “Seresto.” Seresto® for Cats - Product Details, Application & FAQs, www.petbasics.com/products/seresto/?WHGRedir=1. 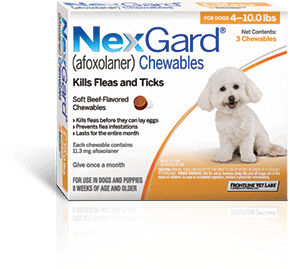 “Tasty Bite-Sized Flea & Tick Control.” NexGard® (Afoxolaner) Protection for Your Dog, nexgardfordogs.com/pages/about.aspx. “Bravecto Chew for Dogs.” Merck Animal Health USA, www.merck-animal-health-usa.com/bravecto/chew-for-dogs. Lyme disease. Most of the tick prevention available in our clinic is safe for pets older than 7-8 weeks. We recommend year round prevention even during the cold winter months. Our prevention comes in several pet friendly options to choose from. We have topical spot on treatments that last 30 days in dogs or 90 days in cats, collars that last 8 months, flavored treats that last 30-90 days in dogs, and lastly topical sprays that last only a few short weeks but are able to be applied to the bedding and environment. When it comes to infestations, we like to treat every pet in the household. We also treat the environment, bedding, carpets, furniture, yard and anywhere else a sneaky tick would hang out. Use tweezers and grasp the tick as close to the skin as possible. Directly extract the tick using slow steady pressure in a rearward motion. Do NOT crush, twist or jerk the tick out as this may expose you to the contagious organisms and may leave the mouthparts behind in the skin. Save the tick after removal for identification. The tick can be wrapped in tape and frozen or kept in a sealed container with alcohol to help with identification as this would help narrow disease differentials in the future. If you need assistance, please bring your pet to the clinic and we will gladly help safely remove the tick from you pet. Côté, Etienne. “Clinical Veterinary Advisor.” Elsevier: Côté: Clinical Veterinary Advisor, 3rd Edition · Borreliosis, 2015, www.clinicalvetadvisor3.com/book/chapter_00002-0110.php. “Ticks.” CAPC Vet, 4 Dec. 2017, www.capcvet.org/guidelines/ticks/.